Experience the pleasure of Cuisipro's razor sharp etched graters with exclusive Surface Glide Technology. Surface Glide Technology is a special grooved grating surface, exclusive to Cuisipro, that creates the perfect balance between ease of grating and maximum efficiency for an outstanding grating performance. The science behind Surface Glide Technology is based on the repeated grooved pattern that is spread evenly across the face of the grating surface. First, the grooves reduces resistance, making it easier to grate food. Second, the grooves elongate the length of each individual blade, so a larger cutting surface comes in contact with food, and more food is grated with each stroke. The ergonomic grip handle and non-slip end provide stability and safety while grating. The protective plastic cover doubles as a measuring device. 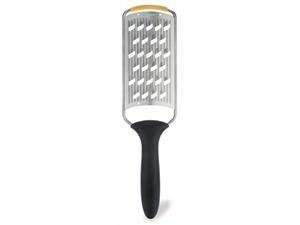 For best results, wash grater by hand.